Boone, N.C. — Residents, businesses, local and state governments, electric utilities and others all across the United States will celebrate October 5th as National Energy Efficiency Day. Proclaimed a national day of recognition in 2016 as part of a bigger Energy Action Month, the purpose of the event is to showcase the benefits of energy efficiency while raising awareness of the need to do more to tackle energy waste. As part of the event, Appalachian Voices, a regional environmental nonprofit based in Boone, is announcing the winner of its 2018 High Country Home Energy Makeover Contest. The organization selected Watauga County resident Amy Cook to receive $4,000 worth of energy-saving home improvements as the grand-prize winner of the contest. Cook works part-time and cannot afford to take on a loan to upgrade her home. Her home was ineligible for the federal Weatherization Assistance Program because a prior owner had already participated in the program, yet Cook still was paying high energy bills, amounting to as much as 60 percent of her income last winter. “The heating situation in the winter was a major issue. It’s a very small house and I’m hot natured, but it wasn’t comfortable at all and the electric bills were still high. I also had frozen pipes the first week of January,” said Cook. According to Appalachian Voices’ Outreach Coordinator, Lauren Essick, this problem exists throughout the region. Data from the US Department of Energy shows that the lowest-income households in Watauga County spend as much as one-fifth of their annual income on home energy costs. Every one of the more than 12,000 households falling under the county median income (approx. $38,000) faced unaffordable energy costs in 2015. According to Appalachian Voices, Blue Ridge Energy, the rural electric cooperative serving the High Country, could do a lot more to address this problem. In 2015, the co-op launched its Energy SAVER Loan Program, which offers loans to qualified homeowners for energy efficiency improvements, as well as rebates to help reduce the cost of improvements. But Rory McIlmoil, Energy Program Manager at Appalachian Voices, says those programs have under-performed and don’t go nearly far enough. “Loan programs only help people who own their home and have good credit. This leaves thousands of families without an option to pay for the energy upgrades they need in order to live more comfortably and lower their energy bills,” said McIlmoil. For Amy Cook, even a modest level of investment is already having a big impact on her her quality of life. 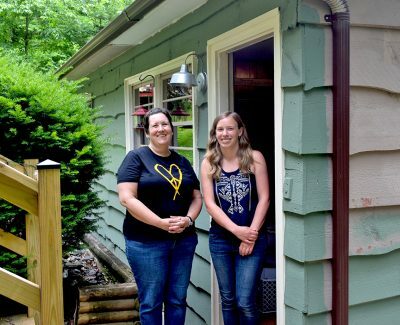 Appalachian Voices partnered with reNewHome, Inc., to conduct a full home energy audit, and hired Edmisten Heating and Cooling to install a new high-efficiency mini-split heat pump in her home. Cook was then able to find other support to pay for insulating her crawl space, an improvement that will save her even more money and keep her pipes from freezing during brutal winter weather. For more information, visit our Energy Savings webpage. Through grassroots organizing in Appalachian communities, Appalachian Voices’ Energy Savings program works to make clean, affordable energy accessible to all member-owners of rural electric cooperatives. We do this by providing the resources, education and training essential for members to participate in the decision-making processes of their co-ops. We also provide electric cooperatives with the tools to successfully implement energy efficiency and renewable energy programs that benefit all members and promote community economic development.